Chromatography ProductsBiotechnology Laboratory ProductsEnvironmental Sampling ProductsAnalytical Laboratory EquipmentWe have added many new products! Laboratory Supply Distributors, Corp. is a Worldwide Supplier of Chromatography Products, Biotechnology Testing Supplies, Analytical Laboratory Equipment, PCR Consumable Products, Cell and Tissue Culture Products, Eppendorf Plastic Tubes and Plates, Reagent Reservoirs and Storage Plates, Environmental Sampling Products and 96-Well Multi-Tier Micro Plate Systems. 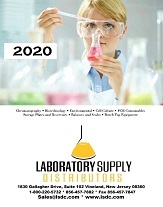 Laboratory Supply Distributors, Corp. is a manufacturer and supplier of unique and innovative products for the analytical, environmental, research, life science, pharmaceutical, biotechnology, and academic communities. We have products ranging from Glass and Plastic Vials to VOA Vials for EPA Analysis, as well as various types of Limited Volume Inserts. Our broad selection of Screw Thread Closures and Snap Top Caps with Septa are sure to impress you, as well as our selection of Biotechnology products such as Microplates, Microplate liners, Sealing Films and Reservoirs. From organic chemistry, to mass spec, to ground water sampling, Laboratory Supply Distributors is your source for all your laboratory supplies.